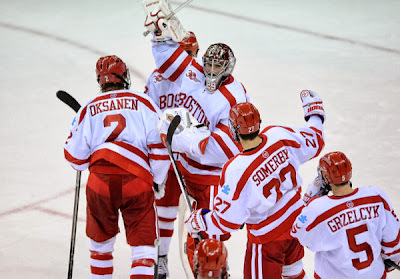 BU bounced back from Friday night’s loss with emphatic 7-3 thumping of #2 Wisconsin before 5,129 at Agganis Arena. Three Terriers—co-captain Garrett Noonan, junior Cason Hohmann and freshman Robbie Baillargeon—each had a three-point night with a goal and two assists. Sophomore defenseman Ahti Okasanen’s power play goal gave BU an early lead that the Badgers matched with their own extra-man goal late in the first. Noonan and Baillargeon scored goals 18 seconds apart in the middle period for a 3-1 lead that was cut in half by Keegan Meuer’s goal for the visitors. Matt Grzelcyk’s power play goal late in the period restored the two-goal margin and proved to be the game-winner. BU outscored Wisconsin 3-1 in the final period with Mike Moran and Matt Lane each recording his first of the season and Hohmann notching his second. Sophomore goalie Matt O’Connor earned his second win in as many starts, with 40 saves. BU scored its seven goals on 26 shots and converted on three of seven power plays. The lopsided BU win concluded an unhappy weekend in Boston for the Badgers who also lost to BC, 7-2, on Friday. That game and tonight’s BU win were Big 10/Hockey East Challenge games. In other challenge games, UMass swept Michigan State while New Hampshire tied and lost to Michigan. After opening with four games at home, BU hits the road to play Michigan and Michigan State next weekend in a pair of Big 10/Hockey East Challenge games. Oksanen, who has points in all four games the Terriers have played, is BU’s leading scorer with a 1-6-7 line and is +5. He earned the game's second star, while Noonan--second in points with 2-4-6--was the #1 star. Baillargeon was #3. BU is now 10-6-0 all time against the Badgers. The last time Wisconsin visited BU was in Quinn's senior year, 1987-88, and, in a game played at Walter Brown Arena, the Terriers triumphed, 10-6. Commenting on the difference between Friday's game and Saturday's, head coach David Quinn pointed out, ""We made the five-foot passes today instead of those long passes we were trying to make last night." 2014 recruit J.J. Piccinich scored on a wrist shot 48 seconds into overtime following three scoreless periods as Youngstown edged Lincoln 1-0. With eight goals in 10 games, the right wing from New Jersey is second in the USHL in goal scoring. 2016 recruit Clayton Keller netted a pair of goals for Shattuck St. Mary’s Prep in a 7-4 win over Team Northwest in Upper Midwest HS Elite League play. Keller (video interview) has an 8-4-12 line in 14 games. Matt Nieto discussed his first-period goal in Thursday night’s game and increased ice time with CSN Bay Area. scored again in the shootout, as Anaheim came away with a 3-2 win. It was the former BU captain’s third goals of the season, after having scored just five in an injury-and-lockout shortened 2012-13 campaign. Recap and video. John McCarthy scored his first goal of the season in Worcester’s 3-2 loss to Wilkes Barre/Scranton. Brandon Yip assisted on both Portland goals but the Pirates were edged by Hartford, 3-2. Kieran Millan stop ed 36 of 37 shots leading the Denver Cutthroats past the Tulsa Oilers, 4-1, in the season opener. Wade Megan assisted on the game-winner as Cincinnati doubled up Wheeling, 4-2. Terriers dropped their first game of the season, a 3-0 blanking at the hands of Robert Morris. Freshman goalie Victoria Hanson, making her first start, stopped 24 of 26 shots before the Colonials added an empty-net goal. BU was stymied on all 21 of its shots by Jessica Dodd.